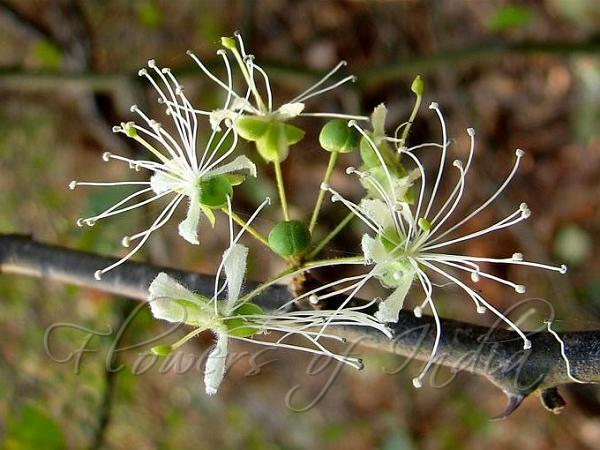 Synonyms: Capparis longispina, Capparis orbiculata, Capparis sepiaria Wall. 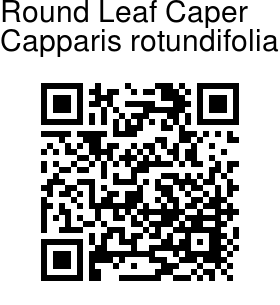 Round Leaf Caper is a small shrub, growing up to 1-2 m high. It has many slender branches and alternately arranged leaves which are nearly circular, 1-3 cm across. Thorns are reddish, of two forms: if recurved 2 - 5 mm long, if straight and acicular, up to 18 mm long. White flowers, 2 cm across, occur on umbels in leaf axils. They are typical caper form, with numerous long prominent stamens, and white small petals, 0.6-0.6 cm long. Occasionally occurs in forest clearings at high elevations in hills. The thorns in leaf axils are highly variable, either short or recurved or long, straight and acicular. Not infrequently, out of the two thorns, one is short and recurved, whereas the other is long and acicular, the latter mostly associated with small nearly stalkless, heart-shaped and mucronate-tipped leaves.